Appropriators are looking to provide boosts to several waiting science programs – if government can be reopened. As the federal shutdown heads into its second month, Senate appropriators unveiled a package late Monday containing the seven spending bills necessary to reopen government. This includes full-year appropriations for the National Science Foundation, NASA, the Department of Agriculture, and other agencies currently shut down. For these science funders, the details in the Senate package are identical to those unveiled by the House Democrat appropriations leadership late last week. This should be no surprise: these final spending decisions were largely negotiated by House and Senate appropriators last fall. Both packages will likely be voted upon in Congress this week. Altogether, the picture that emerges is generally positive for most science agencies. As reviewed below, several programs would receive moderate increases for what remains of the 2019 fiscal year. For instance, the National Science Foundation budget would finally surpass $8 billion, while competitive grants in the Department of Agriculture would receive a 3.8 percent increase. Other programs would be protected from White House-recommended cuts. These decisions follow separate Congressional moves to boost NIH, defense, and energy research last fall. These seemingly-positive developments come with a major caveat: the House package leaves out the Department of Homeland Security (DHS), while the Senate bill includes Administration-backed border security and immigration provisions which are at the heart of the shutdown dispute. Those provisions have already been quickly rejected by Democrats, with House Majority Whip James Clyburn (D-SC) suggesting negotiations could carry on for weeks. The bottom line: many of those shut-down science agencies are teed up for spending increases, but with a deal on border security funding elusive, there’s little chance they’ll see that funding in the coming days. 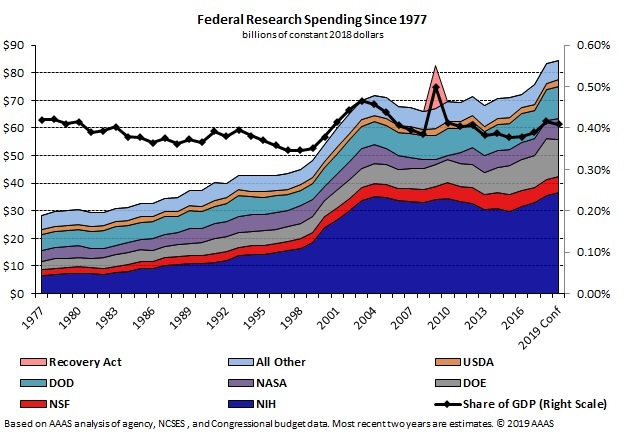 According to current AAAS estimates, research funding in the omnibus would total roughly $85 billion – the highest point ever for such spending (see graph below). Basic research would see an estimated 4.6 percent increase, while applied research would grow at an estimated 1.7 percent. Research as a share of GDP in FY 2019 would fall slightly to 0.41 percent under the omnibus proposal, in line with pre-sequestration estimates. 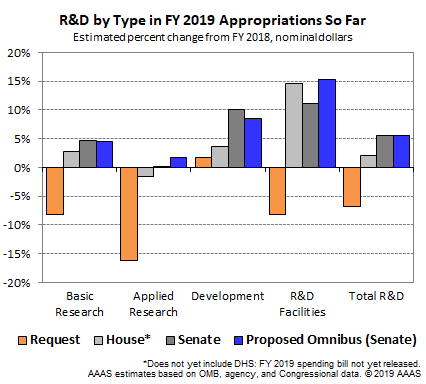 Current AAAS estimates show that appropriators have largely favored basic research, which would see a nearly 5 percent increase under the proposed legislation (see graph). This is the result of strong congressional support for the principal basic science agencies, namely the National Institutes of Health, the Department of Energy’s Office of Science, the National Science Foundation, NASA’s Science Directorate, and the Department of Defense. Applied research has fared less well, with more limited changes for the larger applied research funders like the U.S. Geological Survey and the Department of Energy’s technology offices. DOD’s large applied research programs have also taken a back seat to development during this funding cycle. National Science Foundation. NSF would see a $308 million or 4 percent increase above FY 2018 to $8.1 billion total, slightly below the House Committee recommendation from last summer. NSF’s Research & Related Activities account, which contains the agency’s six research directorates, is slated for a 2.9 percent funding uptick. The spending packages would fund three Regional Class Research Vessels (RCRVs), versus the two RCRVs requested by the Administration. Funding for the Large Synoptic Survey Telescope (LSST) would match the request at $48.8 million, whereas House appropriators had recommended $123.8 million. NSF’s Education Directorate funding would inch upward by 0.9 percent. NASA. The space agency would receive a $764 million or 3.7 percent increase above FY 2018 levels and $1.6 billion above the request. NASA’s Science Mission Directorate (SMD) would see an overall boost of 11 percent. 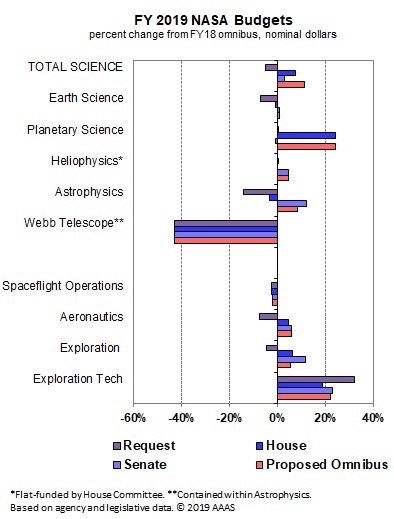 Earth Science would be spared the large cut requested by the Administration, while the Planetary Science program received the House-backed 23.8 percent boost (see graph at right). As part of that increase, the final deal adopts House recommendations for the Europa Clipper and Lander missions; the Senate has previously opposed the lander portion of the Europa project. Funding for the Wide Field Infrared Survey Telescope (WFIRST), slated for elimination by the Administration, was instead granted a major increase to $312.2 million, though not quite as much as envisioned by Senate appropriators last summer. The package also preserves funding for both the Space Launch System (SLS) and Orion spacecraft at last year’s levels, versus the cuts sought by the Administration. Meanwhile, the Administration’s proposed Lunar Orbital Platform would be granted $450 million, along with $116.5 million for Advanced Cislunar and Surface Capabilities. Additionally, the proposed Commercial Low Earth Orbit (LEO) Development account, which aims to assist industry in establishing a commercial LEO market, would receive $40 million, significantly less than the $150 million requested by the Administration. NASA’s education office, which is renamed “Science, Technology, Engineering, and Mathematics Engagement,” would receive a 10 percent boost above FY 2018 levels; the Administration had sought to eliminate the office. Notably, the Senate omnibus bill warns that “the lack of progress across science and exploration programs despite continued significant and sustained investments in these programs is dismaying.” Accordingly, the legislation directs NASA and its private sector partners to address recent deficiencies identified by NASA’s Inspector General and the Government Accountability Office (GAO). National Oceanic and Atmospheric Administration (NOAA). Funding for NOAA climate research would be essentially flat-funded, versus the large cuts sought by the Administration and House Committee. Weather research funding would increase by 2.9 percent while ocean, coastal, and Great Lakes research would rise by 6.2 percent; both areas had been slated for cuts. The National Sea Grant College Program would be spared from proposed elimination by the Administration, and would instead see a small $3 million increase. Funding for the Geostationary Operational Environmental Satellite (GOES-R) and the Joint Polar Satellite System (JPSS) would see funding reductions in line with House Committee and Administration levels, reflecting a scheduled ramp-down of both programs. National Institute of Standards and Technology (NIST). NIST lab funding, the Hollings Manufacturing Extension Partnership (MEP), and Manufacturing USA would all be held flat at FY 2018 enacted levels. The Administration had sought cuts or outright eliminations of these programs. Department of Agriculture. 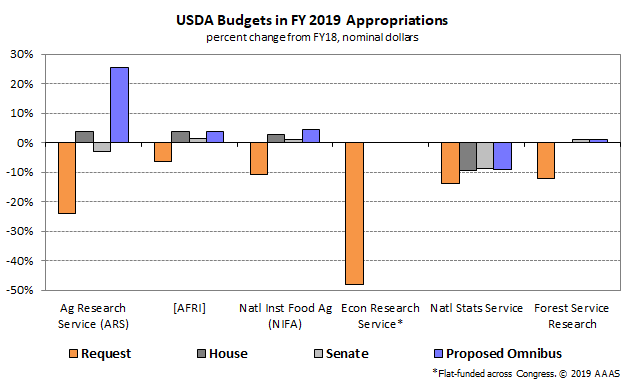 Both the intramural and extramural research arms of USDA would see somewhat larger increases than those weighed by House and Senate appropriators last calendar year (see above). The intramural Agricultural Research Service would receive an 8.5 percent increase above FY 2018 funding to its primary research account, alongside a massive influx of $381 million for construction and modernization of research facilities in accord with the agency’s capital improvement strategy. The extramural National Institute of Food and Agriculture (NIFA) would receive a 4.5 percent increase, with flat or moderately increased funding for capacity grant programs (including a 6.3 percent increase to $259 million for Hatch Act research stations). The Agriculture and Food Research Initiative (AFRI), USDA’s competitive grants program, would end up with the higher House-proposed level of $415 million, a 3.8 percent increase above FY 2018 levels. Elsewhere, the agreement would pump the brakes on the Administration’s proposal to relocate the Economic Research Service and NIFA out of Washington, DC – a move decried by science societies – and instead seeks a full breakdown of costs in benefits in the forthcoming FY 2020 budget request. On the other hand, appropriators gave the green light to the Administration’s proposal to transfer ownership of the National Bio and Agro-defense Facility (NBAF) from the Department of Homeland Security to USDA. NBAF will serve as a biosafety level 4 research center when construction is completed within the next five years. EPA. The total EPA budget is flat-funded at the FY 2018 enacted level of $8.1 billion. EPA’s Science & Technology account is correspondingly flat, versus the 8.9 percent reduction proposed by the House Committee and a drastic 40 percent cut requested by the Administration. Climate change research grants would be spared from proposed elimination. Notably, the Senate bill does not include any of the requested funds for the Administration’s proposed “workforce reshaping” program that would reduce the number of EPA scientists through organizational restructuring efforts. The legislation would prohibit funding for proposed reorganizations, workforce adjustments, and downsizing of EPA’s laboratories. U.S. Geological Survey. The overall USGS budget would receive a small 1.1 percent funding uptick, compared to the 25 percent cut proposed by the Administration. Funding is prioritized for energy and mineral resource activities, with $9.6 million provided for a new critical mapping initiative, and an additional $3.8 million to jump-start Alaskan energy production in the National Petroleum Reserve. Climate Adaptation Science Centers funding would remain equal to FY 2018 enacted, versus the Administration’s proposed cut. The Earthquake Early Warning System was shielded from proposed elimination and flat-funded. However, the Volcano Hazards Program would see some reductions from FY 2018 enacted levels. Landast-9 is fully funded at $32 million.